‘If you have good seeds, you will be ahead of the game’, says Souleman Ballo, a respected elder from Mpessoba, a village along the Segou and Koutiala road in Southern Mali. The 62-year-old farmer is the head of a family of 25 and the president of a local farmer seed cooperative Jigi Seme. Nearly 80% of farmers in Mali rely on low yielding agriculture for their livelihood, often jeopardized by unpredictable rains, poor soils and limited access to productivity-enhancing inputs. Most farmers have daily incomes of less than USD 2, and access to better seeds is often the most promising first step to boost harvests and food security in the country and in sub-Saharan Africa in general. 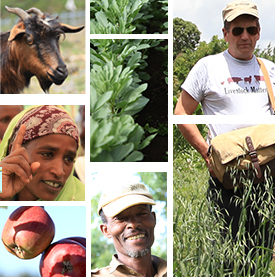 Ballo and his colleagues in the seed cooperative know only too well how important good seeds are for a farmer’s wealth. The cooperative, which is made up of 65 families, produces sorghum and maize and legumes like cowpea. They have recently secured a contract from the United Nations World Food Programme’s Purchase for Progress scheme to sell sorghum grain. They are also engaged in producing quality seeds including new sorghum hybrids. Researchers at the International Crops Research Institute for the Semi-Arid-Tropics (ICRISAT) and the Institut d’Economie Rurale (IER) have developed many improved varieties of sorghum and millet leading to remarkable yield gains. For instance, new sorghum hybrids based on well-adapted local varieties are giving yields 40% higher than the farmers’ best local variety. Ballo reported record yields over three tons per hectare in the best fields where usually farmers harvest one ton or less. This yield increase is life-changing as sorghum is vital for food and income in Mali. Ensuring these improved varieties and hybrids are available to, and adopted by, farmers is the next task. Strengthening the capacity of farmer managed seed enterprises like Jigi Seme is a promising way to do this. Most farmers in Mali are not in the habit of buying seeds because, according to Ballo, ‘they believe a good farmer produces his or her own seeds’. But farmers there regularly test new seeds varieties obtained through mostly informal means, especially from family and neighbours, which are trusted sources as varietal adaptation is critical for the survival of farming households in the country’s highly variable environment. Supporting decentralised seed production and marketing by local farmer seed cooperatives therefore suits farming communities in Mali. Where cooperatives operate, there has been an impressive rate of adoption of improved cultivars. A recent study showed that adoption was 25 -50% in villages where the seeds were produced, compared to the national average of around 10%. According to Ballo, the Jigi Seme cooperative, for example, produced one ton of sorghum hybrid seeds in 2014 and sold it all in 1-5 kg bags (enough seeds to sow in one hectare). He expects even greater success in 2015. Yet, recent seed policies do not recognize adequately the contributions of farmer seed cooperatives and constraints such as rigid and expensive seed certification procedures exclude smallholder farmers. 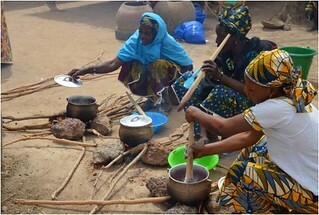 Hopefully, successes of groups such as the Jigi Seme, will influence lawmakers to come up with laws that will support and include Malian smallholder farmers in producing and marketing their own high quality seeds as Ballo and his cooperative aspire to do and by so doing help their neighbours achieve a better life. 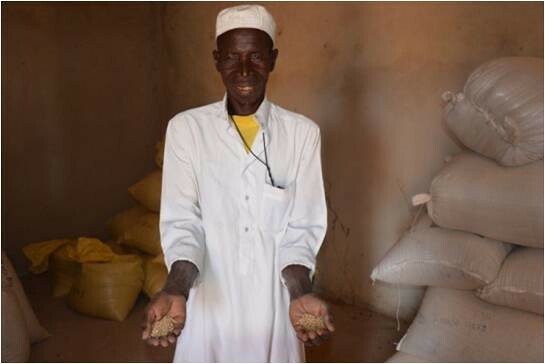 In 2013/2014, Africa RISING supported the initial implementation of activities for developing profitable and sustainable options to intensify productivity of cereal-legume based systems in the Koutiala region in Mali. Sorghum and millet were the cereals focused on by the team. This created the foundation for progress being made by ICRISAT and the Malian Institut d’Economie Rurale (IER) in developing improved and higher yielding varieties of sorghum and millet as a means of ensuring farming communities have access to best seed varieties. Efforts to promotefarmer-managed seed systems were funded by the McKnight Foundation. Tags: africa rising, AMEDD, Mali, seeds. Bookmark the permalink.